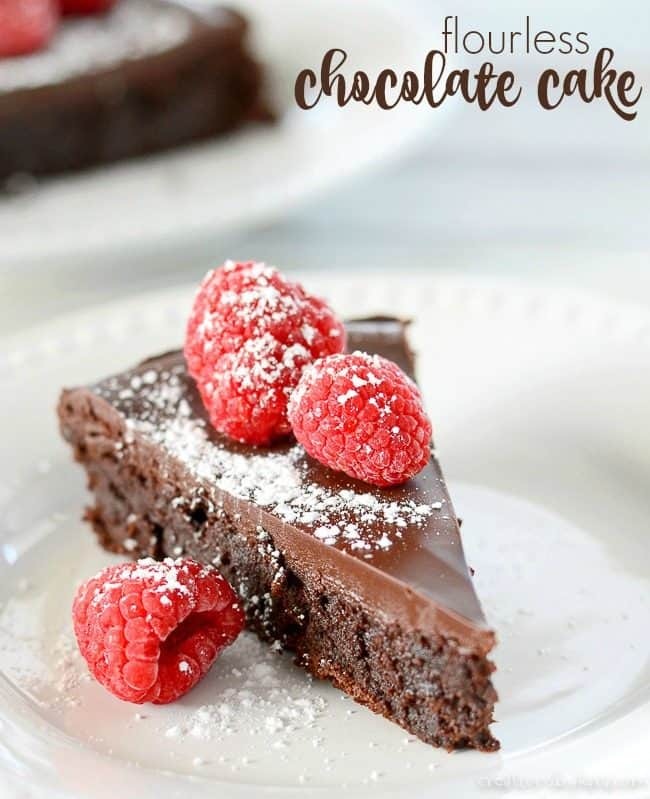 Flourless Chocolate Cake is a rich and decadent chocolate cake that is easy to make and always a show stopper! It also happens to be gluten free. 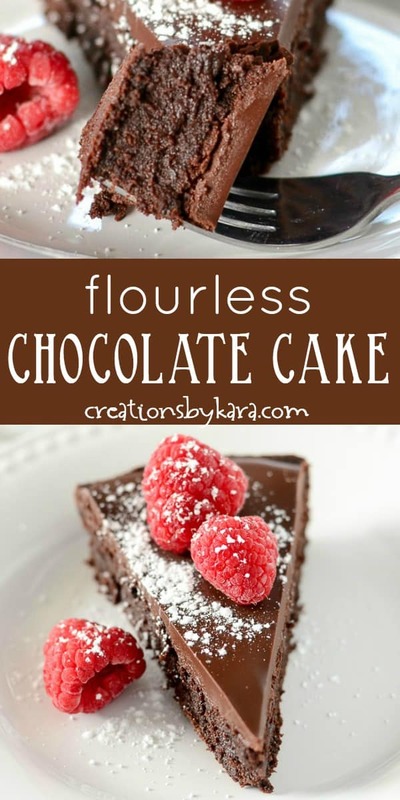 Have you ever tried flourless chocolate cake? 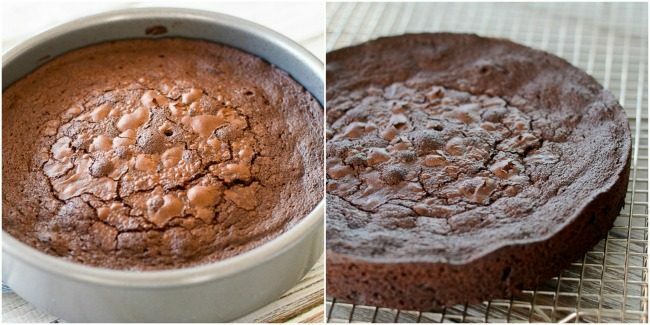 If you are a chocoholic like I am, it is a must make! It is dense and fudgy and perfectly rich. Plus it’s covered with a silky smooth layer of chocolate ganache glaze. 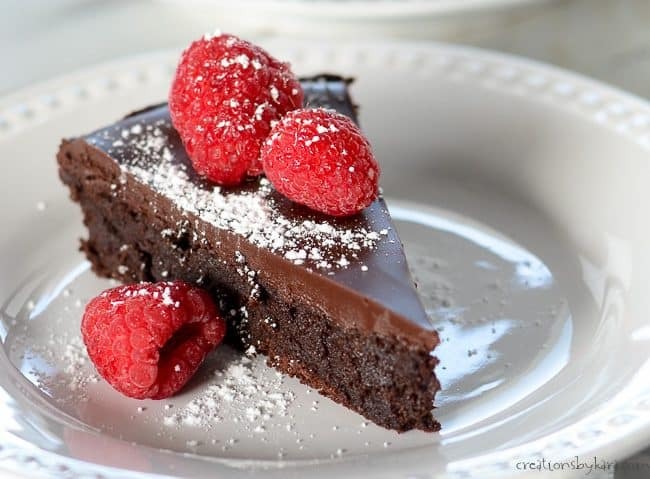 Pure chocolate heaven in every bite! 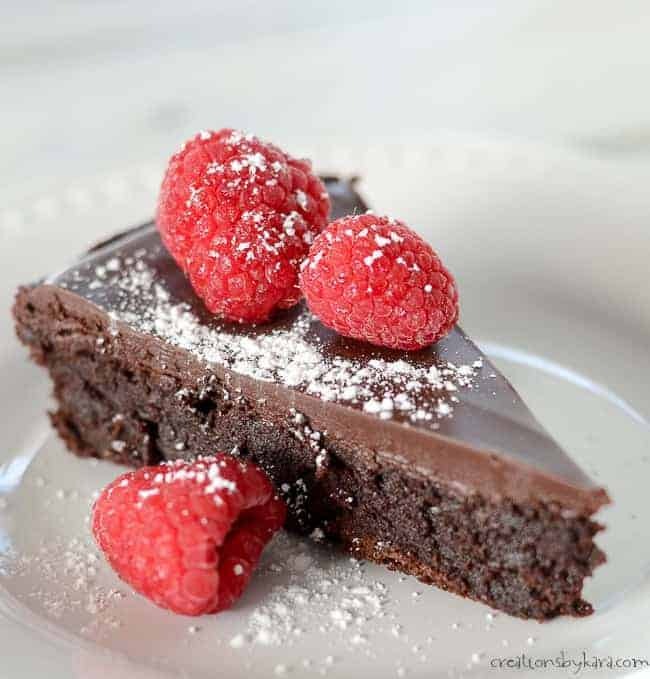 I’ve actually tried several recipes for flourless chocolate cake over the years, but I had a hard time getting great results with any of them. This version turned out perfectly the very first time! Line a round 8″ cake pan with parchment paper and spray with non-stick spray. Set aside. Preheat oven to 375°. Melt butter in a large glass mixing bowl in the microwave. Add the chocolate chips and let sit for 3-4 minutes. Stir together till chips melt, let cool for 5 minutes. Whisk the sugar, salt, and vanilla into the chocolate mixture. Add the three eggs and whisk till well blended. Stir in the cocoa powder. Pour batter into prepared pan and spread evenly. Bake at 375° for 25 minutes or till toothpick comes out clean. Let cake cool in pan for about 10 minutes, then invert onto a cooling rack. Immediately flip right side up onto another cooling rack. Cool completely. For chocolate glaze, combine butter and chocolate chips in a glass bowl. Microwave for 1-3 minutes or till melted, stirring every 30 seconds. Spread glaze over cake. Let sit for several hours till chocolate sets. Serve cake as is, or with powdered sugar, fresh berries, whipped cream, or ice cream. 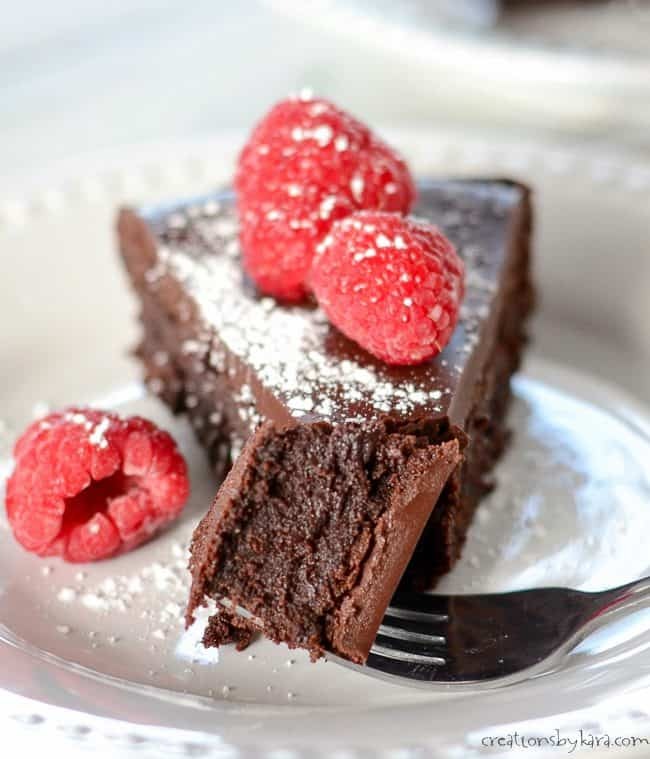 Is flourless chocolate cake gluten free? Why yes, yes it is! Since it contains no flour, it is a perfect option for people with gluten sensitivities. But trust me, even if you aren’t on a gluten free diet, you will love this cake! 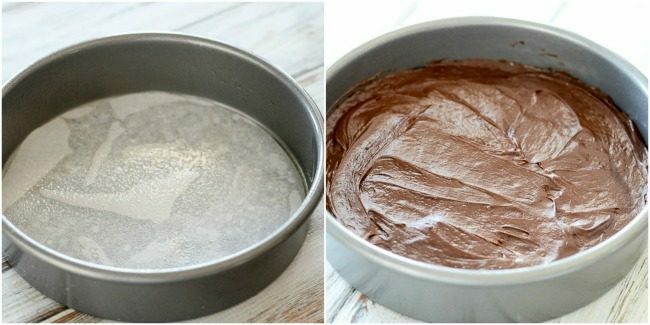 How do I store flourless chocolate cake? This cake doesn’t need to be refrigerated. It will last for 2-3 days at room temperature. If you need it to last longer than that, you can refrigerate it, but it needs to sit at room temperature for an hour or two before you serve it. 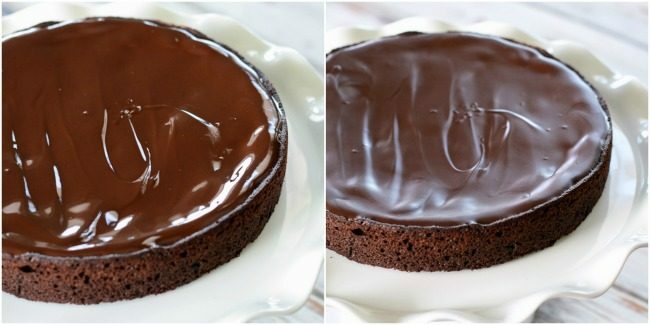 Rich fudgy cake with a chocolate ganache glaze. An amazing gluten free cake! Line a round 8" cake pan with parchment paper and spray with non-stick spray. Set aside. Preheat oven to 375°. Melt butter in a large glass mixing bowl in the microwave. Add the chocolate chips and let sit for 3-4 minutes. Stir together till chips melt, adding additional cooking time if needed. Let cool for 5 minutes. Whisk the sugar, salt, and vanilla into the chocolate mixture. Add the three eggs and whisk till well blended. Stir in the cocoa powder. Combine butter and chocolate chips in a glass bowl. Microwave for 1-3 minutes or till melted, stirring every 30 seconds. Spread glaze over cake. Let sit for several hours till chocolate sets. Serve cake as is, or with fresh berries, whipped cream, or ice cream. Any idea if this would work with a different sugar? Like for instance, coconut sugar? The cake turned out beautifully! Will definitely be making this again and again. So easy and decadent. Thanks Kara! Yay, I am so happy to hear it! It’s been awhile since I had it, I’m craving a piece! Just wanted to mention that the salt was not in the instructions but on the ingredient list. I just added with the sugar. Making this right now! Can’t wait to see how it turns out. Thanks for an easy but elegant cake. Wow this recipe is a keeper … very easy and so delicious . I topped it with vanilla ice cream and choc syrup . I love it with vanilla ice cream as well. So glad to hear you enjoyed it!